Du 1er au 27 octobre au Centre d’art actuel le Lobe de Chicoutimi au Saguenay qui accueil des artistes en résidence. “so far things have been moving rather slowly. i have not yet been able to work with the maison d’acceuil sans abri, but i continue to meet with sylvaine, the director…and maybe this wednesday i will get the chance to present my project to the residents so i can listen to their dreams. 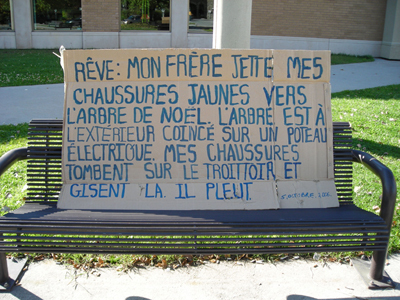 there are no homeless living in doorways, chicoutimi is a small town and it seems everyone has shelter of some sort. my project so far has been to condense into thirty words or less my own dreams and then to write the dream on carboard and circulate on racine street. This entry was posted on	October 5, 2006 at 12:06 am	and is filed under Collaborative projects, dream listener.